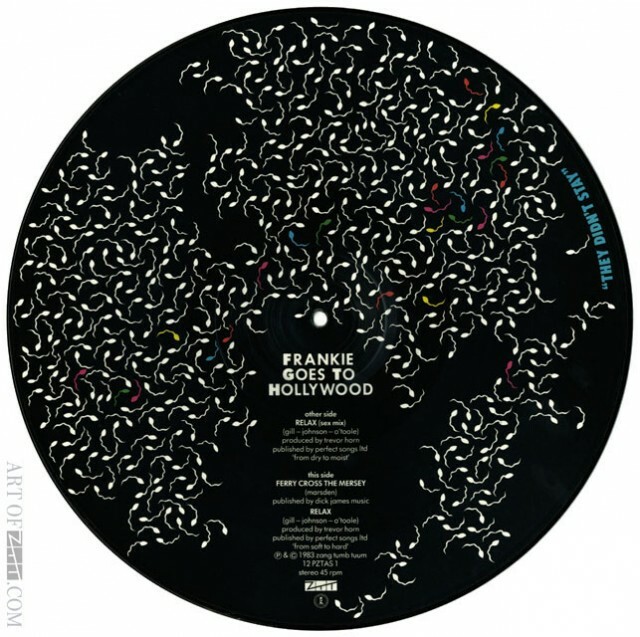 artist: Frankie Goes To Hollywood title: Relax format: 12″ picture disc design: XLZTT photography: AJ Barratt illustration: n/a cat. no: 12 PTZAS 1 date: 23/07/84 art of notes: This version of ‘Relax’ was released during the height of Frankie-mania in the summer of ’84 alongside a cassette version that compiled all the mixes and no doubt helped the song back up to the No. 2 spot. The A side plays the well known 7.20 min ‘US Remix / New York Night version’, the B side is the same as all other ‘Relax’ 12″s. The A side photo was shot at the London launch party for ‘Relax’ at the Camden Palace, the blonde girl with Paul is Ange and the redhead on the floor being straddled by Holly is Juicy Lucy, actually a man in drag, both were friends of the band.